“Welcome to sunny Cowes,” they lied. 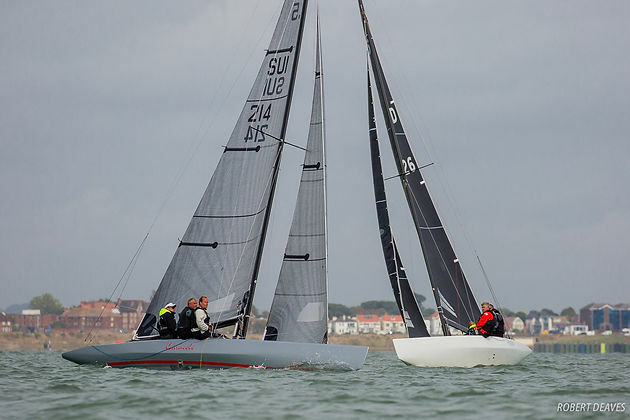 “Due to bad visibility there will be a support boat with its navigation lights on half way up the course.” So began the second day of the Scandinavian Gold Cup at the Royal Yacht Squadron in Cowes. 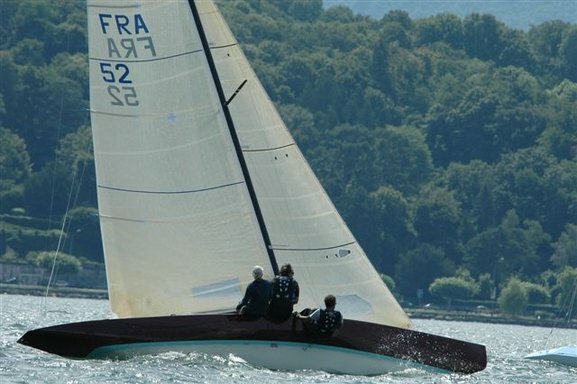 After losing Wednesday’s race by less than a boatlength Artemis XIV, NOR 57, (Kristian Nergaard, Johan Barne, Trond Solli-Saether) struck back on Thursday with two race wins, despite nearly not making it to the start line, to take a 2:1 lead against Marie-Françoise XIX, SUI 218, (Jürg Menzi, Jurgen Eiermann, Bo Selko). 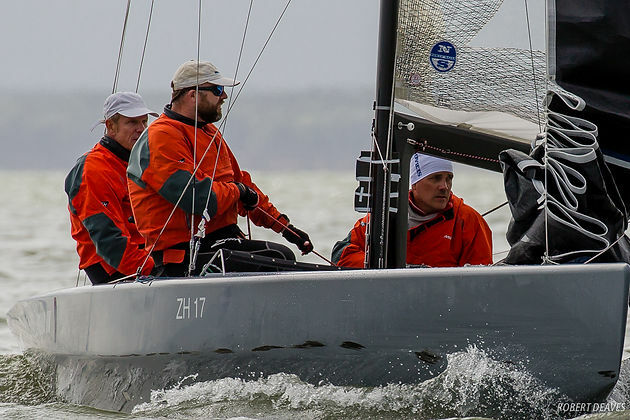 The Gold Cup fleet was also joined by a fleet of hardy Evolution and Classic 5.5 Metres for the first day of the Hankø Evolution Cup and the Royal Kaag Classic Cup. 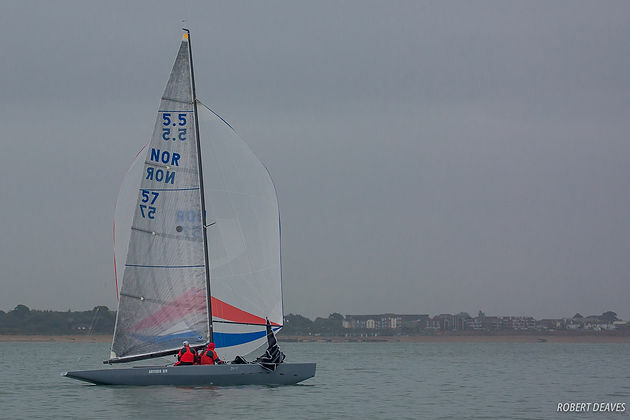 The second day of racing started with proper English weather with non-stop rain, dropping temperatures and a stiff south-westerly of about 15-20 knots. It was proper foul weather and it was going to get worse before it got better. 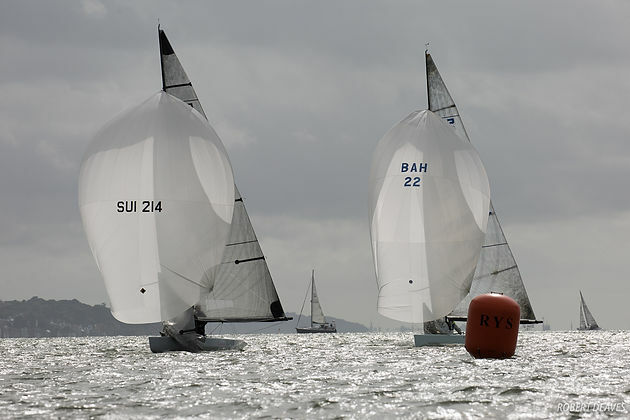 The first attempt at Race 2 ended with an abandonment at the first mark following a 60-degree windshift that left the fleet unable to hoist spinnakers on the downwind. 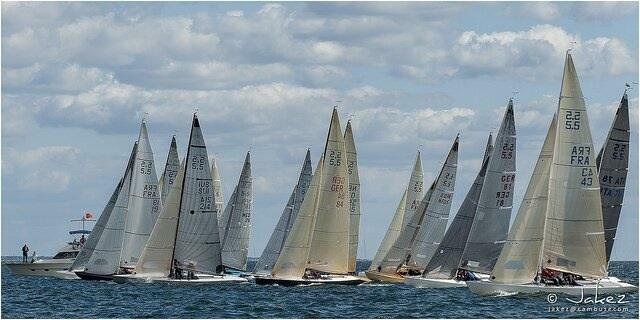 After a short delay a new course was laid with the top marks now set towards Southampton. However, during the race the wind started to shift back to the south and also dropped to 1-2 knots, with nothing but the sound of raindrops on the water to keep the sailors company. The tide was also running fast catching out many unwary sailors who misjudged laylines and marks. Marie-Françoise XIX had a useful lead at the top of the first beat, which was already becoming skewed, but on the second upwind, Artemis XIV sailed more inshore and popped out in the lead for the next four legs, which by now had become procession of one tack beats and tight reaches. Artemis XIV crossed ahead to level the score against Marie-Françoise XIX. In the Gold Cup only race wins count and the first to win three races is the overall winner. After three races only race winners stay in the competition. For the second race, the rain had eased and the wind was starting to come back, albeit slowly. The first few laps were slow progress with Artemis XIVagain finding the best course out of the tide to lead all the way and build a substantial lead at one point. Marie-Françoise XIX never recovered and trailed round in last. It was now 2:1 up for Artemis XIV and only those two boats now progress into Friday. Artemis XIV needs just one more win, while Marie-Françoise XIX needs two. To paraphrase a famous quote, there is no second. 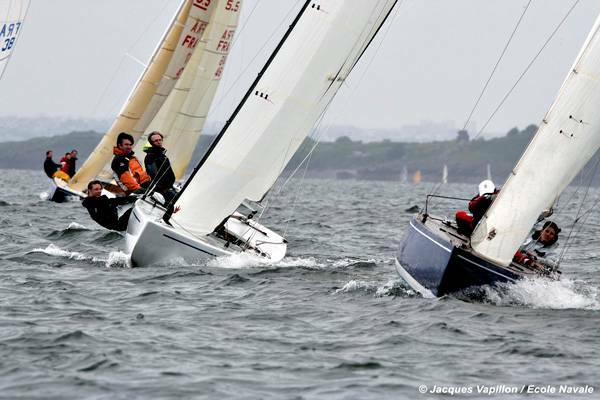 In the Evolution fleet, Auguste 1er, FRA 47, (Gurvan Jaouen, Anne Jaouen, Mael Duigou) and Joker, FRA 50, (Eric Polaillon, Adrien Polaillon, Antoine le Foyer de Costil) shared the race wins, while in the smaller Classic fleet, Carabella, ITA 73, (Alfredo Delli, Gianluca Marolli, Claudio Mazzanti), took both races. Racing continues Friday with potentially two more races for the Scandinavian Gold Cup (but it may be all over with one more) scheduled from 11.00, while the Evolution and Classic fleets will race two more races. 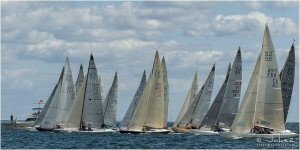 The Kings Cup, presented by the Royal Yacht Squadron will also begin and will be the largest of the four fleets racing, with two races scheduled on Friday and Saturday. Results from Day 2 of all fleet can be found here.